This is by far my most popular post AND pattern! Remember, preemies come in different weights and sizes so try varying your yarn weight and hook size to create different hat sizes! Feel free to share but please link back to my page for proper credit! Thank you so much. This was the first time that I have read a crochet pattern. It was simple and yielded great results. Then did the second one by memory and it turned out great. Round 6 is incorrect – the * should be before skip 1 stitch. Oh my gosh thank you. I kept recounting and recounting and not figuring out why my hat kept turning out misshapen. Do you have a pattern for newborn babies? I would love to make them for the hospitals as long as I have my vision. It is a very simple pattern but looks so nice! No pattern needed! For newborns, simply add 1 more increase row to the preemie pattern and/or increase your hook size. Easy fix! Would you please email this pattern…I would love to crochet it. Well, Joan… You commented right under the pattern! No need to email! Thanks for the pattern. Easy to follow and quick to make. Made the first one in purple and white. Glad you could use it! Isn’t it great for yarn scraps, too?! Hi! 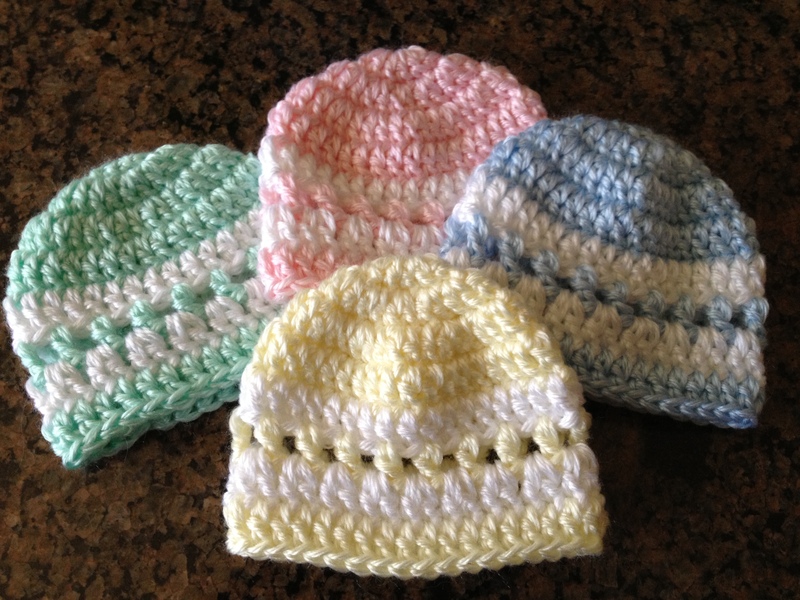 I may be starting a crochet/knitting group to make baby hats for the hospital(s) in my area. Would you be ok with me making a handful of copies of this pattern for the group to use? Thanks in advance. Of course! And thanks for being so considerate! (I’ve recently heard of someone who has copied my pattern (almost word for word) and claimed it as her own. Why do people want to be hurtful on purpose?!) Have a great time with your group! Is someone can tell me the lenght of the hat finished. Mine is about 5X4 inches. for some reason I can’t get this pattern to copy! I’ve tried everything. Well, I can’t answer why (I use the built-in editor on WordPress) and I’ve heard this complaint only once before but I have no idea why! BUT, I have good news… I pulled this up yesterday to do a video tutorial and there are mistakes in this pattern. I’ve fixed them and I’ll email them to you! There’s a .pdf available for you to download, Shirley. See the link in the post. Good morning just found this site and so happy to follow you !love your ideals and all the ways you share what you know to all of us just starting out !God bless you!!!! Thank you, Karen! I’m so glad I could help in some way! You’re not the first person to tell me that. According to tech support, it’s a problem with certain browser settings and the way WordPress (my blog host) communicates with them. So to bypass all the tech talk, I’ve just added a link to a .pdf version of the pattern at the bottom of the page. Have fun! Thank you Dear for such simple and cute beanie pattern – I crochet a lot for donations and this will be one of my favorite patterns. Hugs! Ada. You’re very welcome, Ada! You can zoom through this one and make many! You’re so welcome but more importantly, thanks for watching and being a part of it all! Thank you for sharing your pattern. My daughter was 16 weeks premature, she is all grown up now. Now that my children are all grown up I have time to “give back” to NICU. My goal is 112 preemie hats, one for every day my daughter was in the hospital before she could come home. Hi, this pattern yields a very beautiful hat. I, too make hats to donate to the premature babies born at my local hospital. I am wondering if I could use this pattern? Of course! Free to use for its intended purpose! Hi, thank-you so much for this pattern! It’s lovely! – In row 6 you say to double crochet into the base of the chain 2. What do you mean by that? – Row 7 isn’t making any sense to me. Could you please explain it further? Re: Row 6: “double crochet into the base of the chain 2” is the same as “double crochet in the same stitch as the ch 2” that you did above. Re: Row 7: If you look at the picture of the yellow hat, Row 7 is white row closest to the bottom. (Remember, as you work, your hat is upside down.) In Row 6 you put a single chain stitch between each double crochet, right? For row 7 you’re going to be putting 2 double crochet into that chain one space. It may LOOK like you just did plain dc all around but you’re really just putting 2 dc in each chain 1 space to get the same effect. Can you please include a photo of what you mean by “1 dc in the same st as 3ch” ? I’m not sure exactly where you mean. I’m making them, but I’m not sure I’m doing it correctly. Thank you. I would just love this pattern, will you email it to me???? The pattern is provided right from this page. Simply click on the link. I’ve been unable to open this link? I just checked it and it seems fine and I’ve hand no other complaints. It opens in a new tab. Maybe try a different browser? I’ve made several preemie hats recently and this is my favorite. Easy to follow and quick to work up. Thank you! I’m so glad, Judy! My pleasure! Thank you for this pattern! I would love to make it, but your link takes me nowhere. I just checked it and it’s working fine. It should open in another browser window. Thank you! Love this pattern… it’s not so plain, but not embellished (hospitals don’t want) and is a great volunteer project for all the yarn from completed projects! Thinking of adding mitts and booties for various sets. Working with NICU’s and a 403(b) association with drug addicted babies. Again, Thanks!